Thread: WHY do they LIE? TOO BAD no one REALLY tells the truth anymore! I'm a Republican because I'm a conservative and their platform most mirrors my own opinion....but I wish JUST ONCE we would get candidates who don't have to lie and play with figures. I have found www.factcheck.org to be a really great site in weeding out the truths from the non-truths. Bush claims most of his tax cuts went to low- and middle-income persons. Kerry says Pell Grants were cut. Don't believe either. The debates are over and the results are clear: both candidates are incorrigible fact-twisters. Bush said most of his tax cuts went to "low- and middle-income Americans" when independent calculations show most went to the richest 10 percent. Kerry claims Bush "cut the Pell Grants" when they've actually increased. Both men repeated misstatements made in earlier debates, and added a few new ones. Great site I bookmarked it! I've been on their mailing list for months. I think every candidate should be held accountable for things they say which aren't true. There should be a nonpartisan panel present to correct them right in front of everyone. Like I said on the post......I vote Republican because their platform most represents my view points. I also care greatly about who will be chosing possibly three new Supreme Court judges. Who they are is just about as important as who President...based on the fact that they stay in that position until they retire. Lots of power there. Also....I called the candidates lying. Truth is....it's just the way politics are. You are damned if you do and damned if you don't. I guess each man makes the call he has to. For example: Have you seen the John Kerry commercial in which George Bush pledges to help Seniors on Medicare and "the very next day imposes a 17% premium increase - the biggest in history"? That ad is a stroke of genius on Kerry's part and will surely gain him many votes among the uninformed. Do some homework on the issue. As it turns out the 17% increase was not imposed by President Bush but was mandated by the "balanced budget agreement" signed by President Clinton, voted into law by Senator John Kerry, and was scheduled to come into effect during the Bush administration! President Bush had no authority to reverse what had been voted into law by Senator Kerry during the Clinton administration. It's all about the SPIN! I commented on this in another thread earlier. This is the basis behind why I rarely vote. I simply refuse to vote for the "lesser of two evils". If I know the candidate and have faith in his message, then I'll vote, otherwise, I'll just play video games at home and complain about all the tax taken off my paycheck. I will not blame any political party for doing so though. Also, aren't many politicians familiar with Coorperate Law? If so, then they know all the in's and out's of being criminals. Two men running for office...one being Republican....the other being Democrat.......stand for a party. I'm a member and supporter of my party long after that particular man is no longer in office. I happen to like Bush. Even if I didn't though....I would still support my party because it's the House, Senate and all other various positions which are more important in the long run. The President has less power than people think in passing laws and implimenting change. Therefore, I've never considered a vote as having to chose from the lesser of two evils. Its voting for lesser of 2 evils in this country...we have a third this time round though. We don't know if there evil yet but they have to be better than Tony Blair and Labour or Howard Howard and the Tories. See.....I really LIKE Tony Blair! I wish I had a personally autographed pic of him like I do of President Bush. You don't have to live with the inept f*ckwit, sorry but I hate the guy, as does virtually every person I know. I also hate his party, they promised so many things after the 18 year tory stint and we finally got rid of Margret Thatcher (she's also inept) and they basically kept on Tory policies, screwed public transport and national health. He's pretty much broken the UK in spectaculor fashion. He's a spineless liar who constantly backstabs the UK with policies he said he'd never do, he lied over Iraq repeatedly, he stands up for Dubya who is probably the second biggest hate figure in this country and Europe and says going with the US is best policy. Its only best policy cause if we didn't the US then would black mail us on imports like they've done before (its true, there in court about things like Steel and banana's now). Despite the public turning out en masse, were talking 2 million people here turned up to say NO to the war in Iraq in London. He's basically lost touch with the nation, lies, cheats, uses spin, dodges questions in parliament, installed absolutly retarded idiots like Geoff Hoon as minister of defense who should have been sacked after he basically drove a scientist to suicide. I guess I could open up a can of worms and ask, for discussion purposes, why it is that someone is against the war in Iraq in the first place? Why? Its not about why, its about the BS that surrounded it. First it was terror links which later on where proven beyond doubt to be untrue. What was proved was Al queda actually didn't like Saddam and they had a tenous relationship at best. Also, have you heard of the terrorism in Northern Ireland and the UK over the last century? IRA etc How was that funded? The US allowed Gerry Adams and Martin Mcguinness (A known terrorist and has later confest to several murders) and the Sinfein, the political wing of the biggest terrorist organisation in western europe, the IRA to collect funds and raise money in the US (despite there ban in Britian and them being known as the political wing of the IRA to the US). Then they killed British citizens and soldiers with the weapons they bought with that money. Now when the US and UK governments brought the terrorism card to the table in the build up to the war can you see how pissed off that made me and many other UK citizens? The utter hypocrisy of it. Terrorism around the world is now on the up because of the war. To add, Tony Blair showed his total nievity as well. The last major terrorist theat in western europe was the IRA. How was that issue solved after 30 years of violence and 2000 dead? By diplomatic means. We tried violence, that just pissed them off more so they made more bombs and killed more British people. See where Im going on this? Then there was WMD's. We all knew that Saddam had none, proffessional inspectors said he had none then the US refused to allow a deadline for inspectors and bullied other nations into submission and France said no for very legitimate reasons and then Rumsfeld very childishly branded them "cheese eating surrender monkeys". Very grown up. Admittedly Saddam could have let people in earlier but what sort of message does that send to the world and US? That the US can bully there way into any country cause it doesn't like them (legitimate reason or not). Also the UN is another reason, If it helps please read why the League of nations failed and the United Nations was set by none other than a US president and a British Prime minister. That will explain allot of why the handling of the war in Iraq by the US was retarded and totally Illegal. It makes a complete mockery of the US, British and Commonwealth servicemen who died 60 years ago. Then theres oil. The US is the biggest consumer of oil. 5 million barrels a day. They want a cheap supplier, they have one now and all there companies are in charge of the oil supply as the contract were only awarded to US companies. OPEC controls oil prices. The US is subject to OPEC raising or lowering the price. IF they US controls the oil (Iraq has something like the worlds 2nd biggest supply) who gives a f*ck about OPEC!?!? Then theres humanitarian aspect. The US and Britian pulled that card out there that when the WMD's issue was falling flat. IF the US and the UK gave a sh*t about Humanitarian problems they would have done the job in 1991 when the bulk of the British Army and nearly all there tanks were a few miles from Basra, there was a revolt there and literally thousands died because of Saddam suppressing it. We could have stopped that, if humanitarian issues were really concerning to them then they would be in Darfur now, they would be in Somalia and not pulled out. And they would not be using depleted Uranium weapons or cluster munitions which are proven to pollute and kill for years after they are used. The mind truly boggles. BTW, im not some left wing hippy, I like beer, red meat, women, sport, being childish, computer games, all healthy manly things but this war in Iraq is probably the most ludicrous thing I've ever seen. I must also add I don't hate the US, I hate the current administrations foriegn policy and BS surrounding these wars there creating. Also I'd like to add the current problem is Iraq is actually the fault of the UK. You'll need to read up on the history of the middle east last century but the fault lays with when Britian was an Empire. That was an excellent post Mondo. I really appreciate people who have an opinion with some facts and thoughts behind it. I've always told my children, and others, they don't have to share MY belief...they just need a valid reason to have one for themselves. Lots of people just spout what they hear instead of really checking and thinking for themselves. I'm going to check out the link you provided. Thanks. I must admit to a feeling of awe in Mondo's post. Though I cannot comment directly on the facts posted in this topic, I can say that the replies seem to be extremely well thought out. It's great to see a place where political discussions stay discussions and do not turn argumentative. 7. Q: What percent of US military spending would ensure the essentials of life to everyone in the world, according the the UN? A: 10% (that's about $45 billion, the amount of funding initially requested to fund our retaliatory attack on Afghanistan). 9. Q: How long has Iraq had chemical and biological weapons? A: Since the early 1980's. 10. Q: Did Iraq develop these chemical and biological weapons on their own? A: No, the materials and technology were supplied by the US government, along with Britain and private corporations. Those are true facts. However, it doesn't explain some of the reasoning behind the decision making. 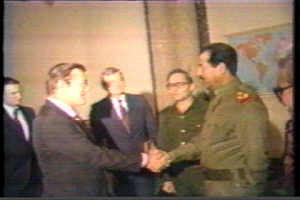 The UK and the USA chose to work with Saddam Hussien during the Cold War as the lesser of two evils. At that time we were in the Cold War and the threat was coming from Russia to take over the oil capacity of Iraq. The USA only gets 10% of it's oil from the gulf region. However, this is not true for Europe or Asia. If Russia had gained control of the oil....it would've resulted in a financial disaster of global proportions. In 1998, it was passed within our House and Senate under the Administration of Bill Clinton that Saddam Hussien had not met the UN Guidelines and therefore he had to be removed...even if by military force. I believe we goofed around and his WMD were transferred to Iran. We KNOW he had them...because he's used them. There is a lot of ducumentation to support this. Was the later intelligence faulty....I don't know. We should have removed him based on the 1998 Agreement and called it a day. I also personally believe that (as per his own statement as late as last Sunday) terror mastermind Abu Musab al-Zarqawi has declared his allegiance to Osama bin Laden, saying he had agreed with al-Qaida over strategy and the need for unity against "the enemies of Islam." al-Zarqawi considered bin Laden "the best leader for Islam's armies against all infidels and apostates." 911 was only ONE occururrence. The WTC's has been bombed before, out Marine barracks were bombed in Lybia, the USS Cole was bombed in Yemin and these are just he American attacks. These have all resulted in loss of life. It's NOT acceptable. Now that the UN is A$$ deep in their scandal with France, Germany and Russia.....why would I even begin to believe they have any integrity? OFCOURSE they didn't want us to go to war against Iraq! The European propaganda machine against the UK and USA has spread nothing but half truths and clouded the issue. I'm not taking up for Bush or Blair....I'm only suggesting that not all basic facts paint a picture of the entire truth. I'm not always right either.....this is only my sketchy personal thoughts on the matter. The funny part is that even that impressive list of facts doesn't tell the whole story I bet. Yeah Duke...that's what I was saying at the bottom part of the post....AFTER listing the known facts. AARRGG! Sorry, I think I started drifting off halfway through the post. I currently have the attention span of lettuce. It was too long and stupid to make any sense anyway! Sometimes...I ramble! Quite honestly, as Canadians we here more about the US than we do about Canada. No offense, but sometimes it can be a bit much. Looks like another smiley to add to the db. I need a Duke smiley lol.